Recently , I had finished watching a documentary on Youtube that was an hour long. A documentary by Air Crash Investigation that investigates the case of our own nation's horrific tragedy : The crash of AirAsia flight QZ8501. The pilot of the flight was a former fighter pilot with a total flying hours of 20000 and the co pilot however only has 2000 flying hours.The flight took off from Surabaya Airport at dawn approximately 5.36 a.m en route to Singapore. To arrive at Changi International airport, the plane must cross the Java Sea which is one of the deadliest air traffic zones in the world because it is called the tropical convergence zone where big storms and terrible weather build up in that specific area. 20 minutes into the flight, the plane was cruising at an altitude of 30000 feet.Minutes later, the air traffic controller received a request from the pilot of QZ8501 to deviate left because of the bad weather forecast up ahead. Due to so many airplanes needed to be taken care of, the air traffic controller denied the request and the pilot is left with to possible choices : disobey the order and turn left or fly right into the eye of the storm which is a nightmare for every pilot to be in. Soon , the air traffic controller lost contact with the plane. Within 3 hours after the announcement of the missing flight, a rescue operation has been launched involving three nations - Malaysia, Singapore and Indonesia. Just after two days later, bad news strucked the victim's families. The flight had crashed into the Java Sea killing all 162 people on board. It was a nightmare for the aviation industry and the society especially families of their lost ones. One of the possible theories that was brought up by the NTSB , instrument failure. The investigators feared that the pitot tube place below the belly of the plane froze during the flight and as a result will give a faulty reading on the airspeed. This scenario was then later proven with an analysis that during the flight QZ8501, there was a surprising tempreature of -112 degrees fahrenheit which is equivalent to the coldest day in Antarctica. The second theory was human error, Could it be the pilot's fault? Could it be pilots intentionally sabotage the flight ? The last theory was weather. During that time, thunderous storms were building up in the sky. Furthermore, the black box indicates that the plane climbed to 38000 feet from its initial altitude which was 30000 feet. An astonishing rate of 4000 feet climb per minute. Every plane has its own minimum and maximum altitude and for this particular plane, it had exceeded its capability. Consequently, the plane was in a zone called coffin corner where planes need to be controlled at the right amount of speed and control. The correct theory was a combination of instrument failure and weather. The pilots were not to blame. 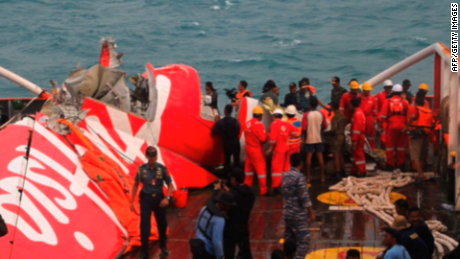 The research had proven that the rudder broke in midair, causing the plane to lose its controls. This proves the weird flight path of the plane where it climbed steeply and dived down into the sea like a dead fly. My heart goes out to every victim of the crash. May God bless their souls.